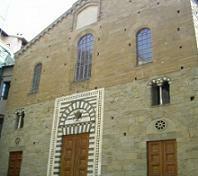 The church of Santa Maria del Fiore (better know as the Cathedral) was the result of an architectonic project studied by Arnolfo di Cambio in 1296. 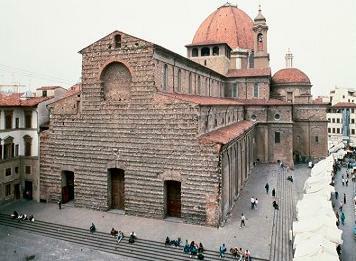 The Dome was a work of Brunelleschi while the façade was completed in late 1800. 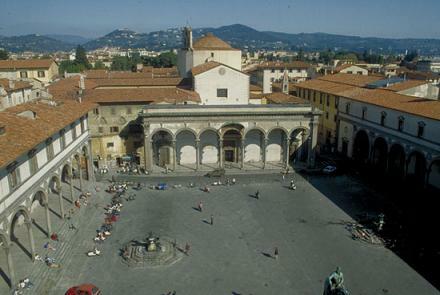 The Dome (ottagonal, 46 metres in diameter at the base, 114,5 metres in height) was built without the use of props to support the arches but whit a technique scrupulously studied by Brunelleschi, who fought against the scepticism of his fellow citizens. The idea of the project was to lighten the imposing structure using innovated machinery. 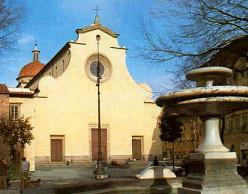 Brunelleschi won the competition instituited in 1418 but he had to wordwith another artist: Ghiberti. 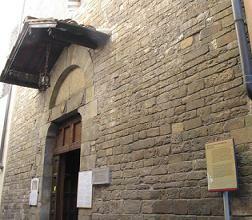 Brunelleschi did not like the situation and he threatened to tear up his project but afterwards challenged Ghiberti giving him his project. 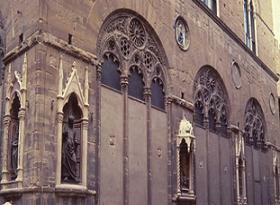 After a short time Ghiberti gave up admitting his incapacity in being able to understand Brunelleschi's writings. Everything returned to the legitimate owner and the building proceeded: it was 1420. The interior of the catedral is a spectacle which has to be seen, sculptures frescoes and marble floors. 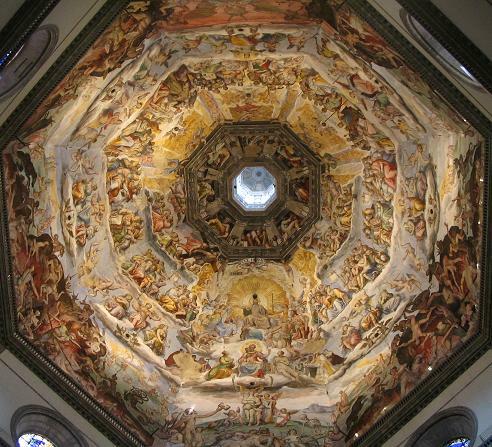 The Dome's paintings form the widest, cyclical mural painting with sacred subjects, that is known. A surface of 4.305,56 square yards of paintings executed up to a height of 90 meters. 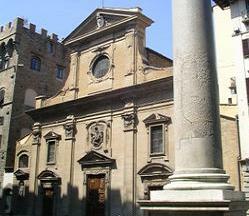 Many artists worked to beautify the Cathedral in various centuries. 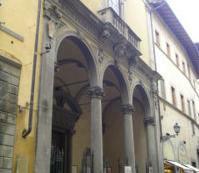 We can mention a few, Andrea del Castagno, Giorgio Vasari and Federico Zuccari. 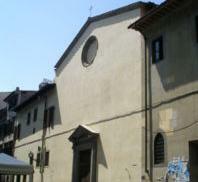 Many partook in the project (other tha the above mentioned Brunelleschi, Arnolfo di Cambio, Ghiberti) we can name Giotto, Andrea Pisano e Francesco Talenti. 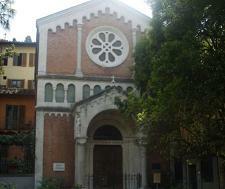 The exterior covering is made with white marble (from Carrara), red marble (form Siena) and green marble (from Prato). The lanter on the top of the Dome was placed in 1461, the fachade was completed in 1886. 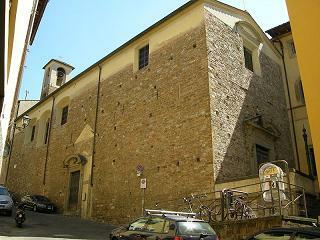 The Battistero and Giotto's church steeple are very near the church. 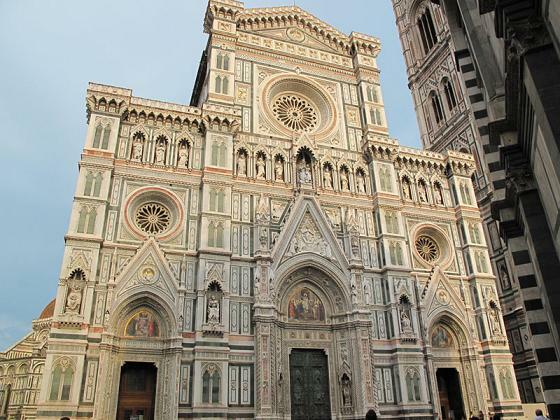 The Cathedral, or Santa Maria del fiore, whose construction was begun by Arnolfo di Cambio on September, 8th 1296, is the fourth church of the world (after S. Peter in Rome, St. Paul in London and the cathedral in Milan). 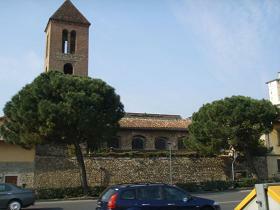 According to some experts the design of Arnolfo was different from the real structure of the church, but the perimetrical walls are for sure those of the initial project. 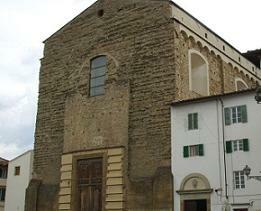 At the death of Arnolfo, around 1310, the works slowed down, to start again in 1331 when the magistrates of Arte della Lana assumed the care of construction. 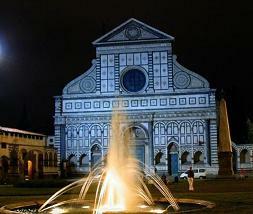 In 1334 Giotto was named Master builder of the Works. 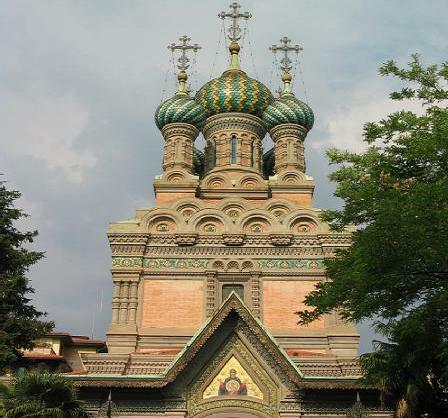 He mainly took care of the construction of the bell-tower and he died three years later. The works went on till when in 1367 it was accepted the definitive design of the church proposed by four architects and four painters. In 1378 the vault of the middle nave was finished in 1380 also the mainers nave were completed. Between 1380 and 1421 the tribunes were built. 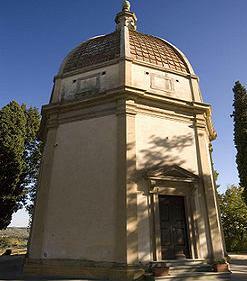 The octagonal Dome formed by two ogival calottes joined together was finished in 1434 according the design of Filippo Brunelleschi presented in 1418 and accepted only in 1420. 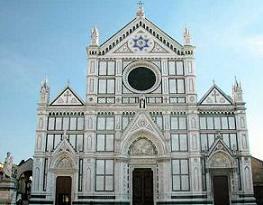 The temple, dedicated to Santa Maria del Fiore ( the flower referred to Florence) was consecrated on March, 25th 1436. The Cathedral revealse in all its parts some differences in style, demostrating the change of taste during the time from its foundation to its completion. At the outside, the design of the round arches remindes a romanic influence. 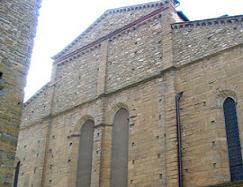 The inside structure with the big arches and the ogival voults is gotic. The dome belonges to the Renaissance. 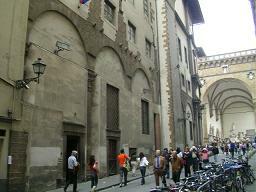 The facade eventhough is in gothic style is of the XIX century. 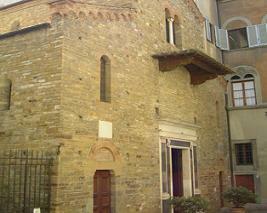 On the left side of the Cathedral there is theDoor of Mandorla, XV century, still in gothic style. 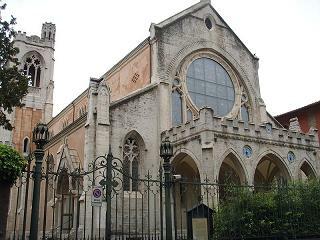 The inside is in the form of a latin cross divided in three naves with arches and ogival voults. 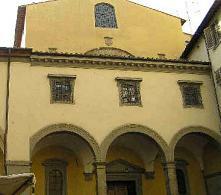 On the left nave the affrescoes of Paolo Uccello and Andrea del Castagno. The terracotta on the doors of the two sacristies are by Luca della Robbia, while the design of the windows is by Lorenzo Ghiberti. This is one of the most important religious buildings in the world, and not only because of its size. 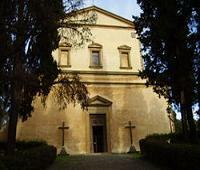 It was built over the remains of an early-Christian basilica, and work was begun by Arnolfo di Cambio at the end of the thirteenth century. 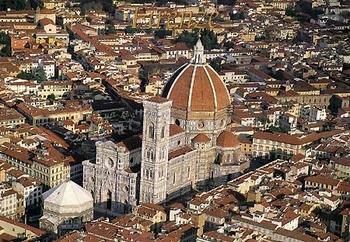 The immense dome, a true feat of engineering by Filippo Brunelleschi was completed in 1436. 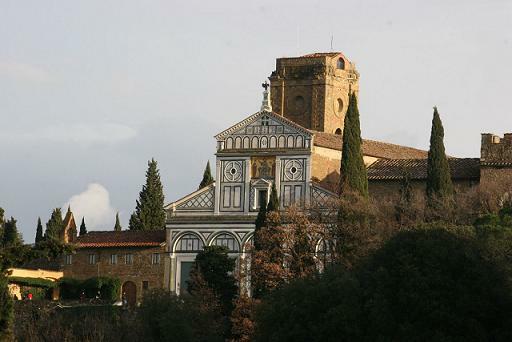 Inside the cathedral are masterpieces by Andrea del Castagno, Paolo Uccello, Luca della Robbia, Michelozzo, Vasari and Zuccari, as well as extraordinary fifteenth century stained glass windows by the major artists of the era. The façade was added in the nineteenth century. 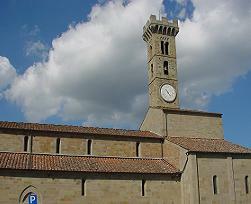 Giotto’s famous bell tower soars skyward alongside of the cathedral.